The inaugural conference of the Joint Master in Parliamentary Procedures and Legislative Drafting (EUPADRA) took place on Monday 3 October in the magnificent premises of the Italian Chamber of Deputies in Rome, Italy. The conference had the title “THE TRANSFORMATION OF PARLIAMENTARY ORGANISATION BY TECHNOLOGY INNOVATION“. 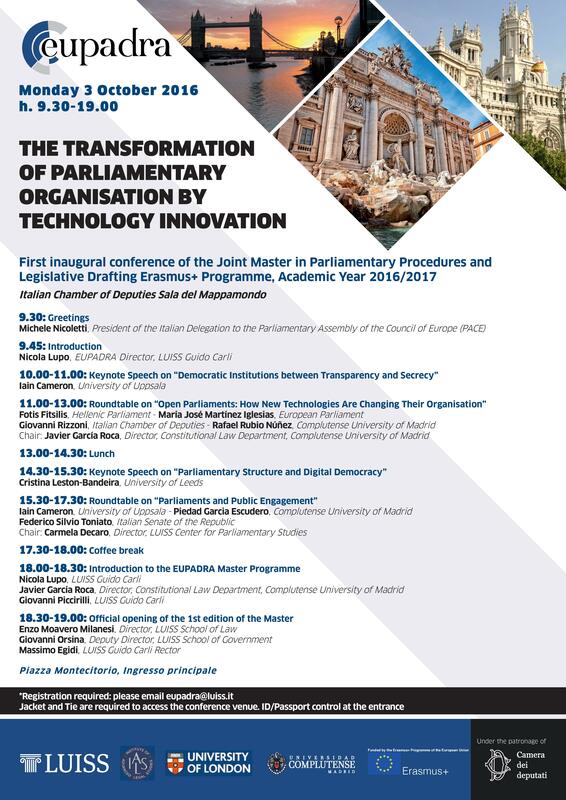 The inaugural conference of the EUPADRA Joint Master, the full program of which is presented below, aimed at investigating the transformation of Parliamentary organisation under two complementary perspectives: the analysis of the impact of new technologies on the organisation of Parliaments, and the exploration of the transformation of participatory models that new technologies may trigger, understanding its effects on the role of Parliaments. My presentation in the open parliaments roundtable dealt with new technologies and the way they change parliamentary organisation. In particular, the basic components of eParliament systems were presented and the role of IT tools in increasing administrative efficiency was assessed. The Hellenic Parliament was used as a case study. The presentation was concluded by a brief discussion of contemporary and future parliamentary projects on big data, open data, internet of things and new trends in digital democracy.